I had a practical welding course and what amazed me most was the flash of the electrode burning. Before we started the course, I saw one of the instructors using the arc welding machine, and what captured my attention most, was the arc and ultraviolet rays, that were released during the process. I’m sorry I didn’t take photos. Using gadgets in the lab is prohibited -Safety reason. The reason why my thoughts were so focused on the radiation, was because of the sharp pain I felt, in response to looking at it, which stimulated me to move my face away, immediately. Another reason, was the thought of how constant staring could cause great damage, and also the fact that I use medicated glasses. Throughout the experiment, I tried my best not to look at the rays, not even with goggles, because it was the first time I was so close to such working process, and because of what I heard of people who practise welding. During the course, we were taught some of the safety precautions to be taken while welding. One of which, was wearing welding goggles and helmets to prevent ARC EYE. The term arc eye wasn’t explained further to us because we weren’t in a biology class. So, out of curiosity and great concern, and among everything I was taught, I decided to single out, and research further, on what the arc eye was, relating to welding. 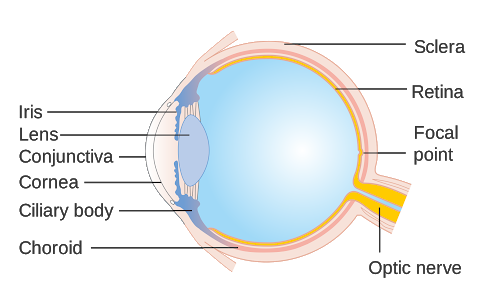 Above is the diagram of the eye. Our main focus here is the cornea and the conjunctiva. The cornea is the clear and transparent outermost layer of the eye, with functions of filtering UV radiations and focusing light rays for clear vision. The conjunctiva is a thin membrane which covers the front surface of the eye, with primary purpose of keeping the eye moist, lubricated and protected from tiny particles, including microorganisms. It is linked with the cornea. Whenever these parts of the eye, suffer inflammation or burns, as a result of excess UV rays entering the eye, a condition called conjunctivitis occurs. Other terms to define the conjunctivitis includes, the 'arc eye', 'arc flash', 'keratoconjunctivitis photoelectrica', 'photokeratisis' etc. In welding, it can also be called 'welder’s flash'. During welding, the arcs gives off radiations of a large wavelength range. The range depends on the transformer rating and the input current of the welding machine. The range includes the UV radiations, visible light and infrared rays. 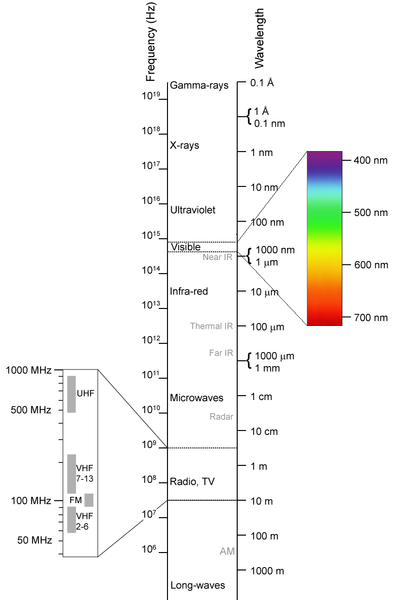 Within this range of wavelengths, the UV radiation has the shortest, which is about 100nm – 400nm(nanometers). If you are an engineer, you’ll understand that from the above statement, the UV rays, have the highest frequency among the emitted rays, and therefore the highest penetrating speed. This speed exceeds that of the can be visible to the eye i.e visible light(see chart above). Therefore, the UV radiation at a certain intensity(closeness), is dangerous to the eyes. When the UV radiation reaches the eye, the section with the longest wavelengths (280nm to 400nm) is absorb by the cornea and maybe, the lens of the eye, and the other section with the shortest wavelength, passes through, to the retina. Long exposure of the eye to these rays at high intensity(close distance range), stresses its nerves out and injures the surface(cornea) and membrane(conjunctiva). At this point, the eye suffers from arc eye. Photophobia and high sensitivity to light, even of low brightness. The severity of these symptoms once again depends on how close you are to the arc and how long you are exposed. We must note that the eye is very sensitive, and even just short exposure could cause a whole lot of damage. Besides that, the arc eye isn’t the only hazard in the welding processes, even concerning the radiations and the eye. When the lens of the eye absorbs too much rays, it gets clouded and vision gets blurry, this is known as cataract. It is a long term effect i.e manifests itself after series of exposure. Other possible hazards of the radiations, are skin burn on unprotected skin and the extreme of all, skin cancer. I can’t really give a broad enlightenment on this paragraph because it is not really my field. Although, I’ll try my best to ensure that, links to external blogs will be provided at the end, to enable you read more on these hazards. Safety precautions and rules to follow in the welding workshop are simple. Just ensure to wear your PPE(personal protective equipment) or your protective gear. It includes a leather shoe(boot), apron or coverall, thick gloves, safety goggles, the helmet, etc. All these equipment prevents the radiations and sparks from passing through to your skin, eye or any part of your body. As a result, one wouldn’t think of having cancer or the arc eye or even skin burns and jobs would be done smoothly. Basically, each engineering process has its own errors, hazards, dangers, rules and precautions. As an engineer you must follow the rules to avoid hazards, and to yield perfect results. 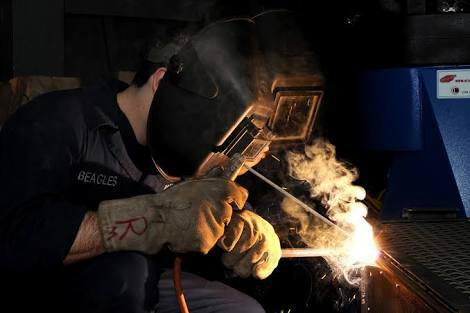 When welding, always be careful of the radiations, because to a certain extent and beyond it, they are dangerous. Therefore always read manuals and ask help from experts and instructors, and above all, be Safety conscious. Very helpful... welding is an awesome skill but the dangers are certainly real for your eyes! It's really an amazing skill. My dad is a professional but I can't learn practically since I'm myopic. Thanks for visiting my friend!! You are welcome @lana95, thanks for coming by!! I see you everywhere now....hehe. Basically, each engineering process has its own errors, hazards, dangers, rules and precautions. As an engineer you must follow the rules to avoid hazards, and to yield perfect results. Hi Promzy, been a while.. Glad you're here now. Sorry I missed your birthday wishes :( and with me being everywhere I think I'm too lazy for that, hehe. Nevertheless, the summary is perfect!! No... You still owe me the wishes, maybe a gift or a call too.